UFO stands for Unidentified Flying Objects. Do you believe in them? Many reports say they exist and that many people have seen UFO s landing on earth. But do they really exist? Are there aliens coming down to earth from those UFO s? Yes, I do believe in ufos because we are just 1 planet in a never ending universe. So in a never ending universe there has to be billions of planets. I'm sure in all those planets that there is more life. There wouldn't just be 1 universe for 1 planet of life that wouldn't make a lot of sense for us to be alone. So anyways out of all those planets there has to be better technoligy then we have at the moment. So they have better air crafts. And the people in the air crafts might be scientists in like a mini plane studying earth and what we do. They also have so much evidence to back ufo's and aliens up. Roswell is one thing that actually is a pretty interesting topic. How a ufo crashed in the farm fields and there wads un explanable air craft parts that would scratch burn or break and at first the goverment was saying extrateresstiral then he changed it to weather baloon so maybe it was a cover up does the government know more then us? And what about Area 51 that is supposed to be a place where they build alien aircrafts and test them there but no one has ever gotten in because of the maximum security so there has to be somthing going on there with the amount of security they have. There has also been many reports on abduction. Some are classified as fake and some can not even be explained so this means there may be extra life out there because of all the evidence and sightings. Also and the ufo on that highway interstate that tons of people saw it stalled cars and messed up electricity but when it passed everything was normal again so that is also pretty interesting. So to sum it all up I thinks ufos exist because of the never ending universe that contains main planets better technoligy somewhere out there, a lot of evidence, and there is many stories and places that have some sort of proof that aliens and ufos may exist. This is why I think aliend do exist. Yup i do..There must be aliens in cos if a planet like earth can exist, y cant a similar planet exist somewhere else in this universe?? Universe is too large just to hve a single planet with life forms..
yeah i beleive in UFO because i think like our earth their should be some place in Universe their will be another planet like earth where life will be possible. i do not beleive that UFO coming down to earth but they must exist somewhere in universe where a man does not able to catch them. Yes, i do believe in them. i havnt seen any UFO but i wish to see any. Our studies tells that there is somethig outside the earth that exist and undoubtly it may be UFO. I believe in UFO. 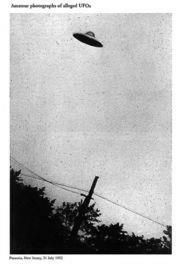 Many articles can testify that they seen a UFO many times. Maybe america have a secret about UFO and they never people know it and have a panic. i personally remain doubtful, i used to e very sceptical about alien existence and the claims of UFO sightings but after watching some programms on the Discovery channel about it has changed my mind a little bit where former military men even claim to have encountered them and people claiming of being threatened not too tell anyone else about the government cover ups, although 90% of those claims are false either mistakes or just plain lies but still 10% of them cant be explained even by the Government officials......so this certainly provokes the idea of possible alien existence but still, hey! im not jumping to any conclusions here.